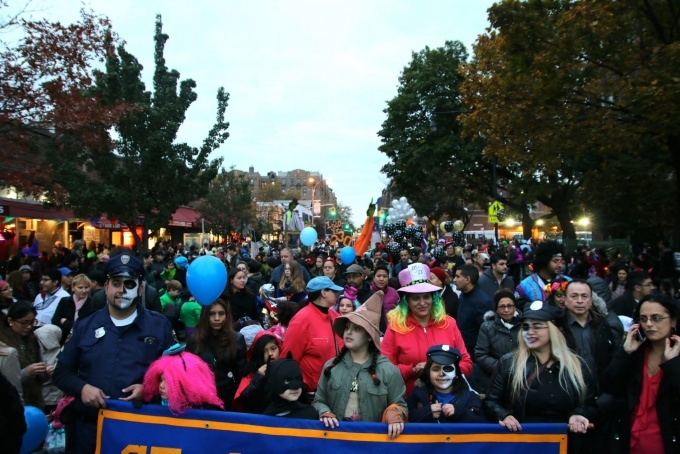 New York City’s second-largest Halloween parade is returning to Jackson Heights for an ever-spirited 28th year. The Jackson Heights Beautification Group, which organizes the popular annual parade, says it is anticipating its largest crowd yet in an event that typically sees more than 3,000 attendees. The parade will start at 5 p.m. on Oct. 31 at the usual corner of 89th Street and 37th Avenue. Costume-clad marchers will then march down the avenue to the parade’s end at 76th Street. At the end of the route, 3,200 bags of candy will be handed out to participating trick-or-treaters—one of the parade’s many highlights. Nuala O’Dhoerty, president of the JHBG, says the parade’s growing numbers are a result of the many schools that it partners with for the event. The group gives each participating school a set of balloons in a specific, identifying color for the march. Schools also carry large banners, and come with its bands and dance groups to the parade. “It’s kind of a show of school pride, so every year it grows a bit,” she said. This year’s participants include PACONY, Fort Prep Academy, Lexington School for the Deaf, P.S. 212 and P.S. 69, among nearly 20 schools and groups. Len Maniace, former president of the Jackson Heights Beautification Committee who now serves on the board of directors, first walked in the parade over a decade ago with his own children. Despite the parade having grown exponentially since then, Maniace says it always felt like it filled the streets. He sees the event as a great opportunity to get dressed up and be a little silly. “It is just so much fun in the neighborhood’s backyard, on our main street,” Maniace said.